But there is homemade apple cider vinegar. And I’m going to venture to say it’s about as close to a free lunch as you’re going to get. 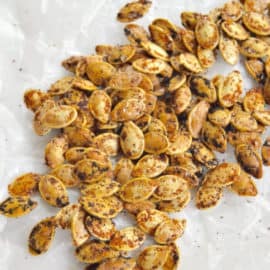 It’s no secret us homesteader folk are complete fanatics about the stuff—we use it for everything from cleaning, to cooking, to animal care and everything in between. The health benefits of raw apple cider vinegar are totally impressive, too. But did you know you can practically make it for FREE? There are several more elaborate ways to make apple cider vinegar at home, but today I’m gonna show you how to make it from apple scraps. I especially like this method since it allows me to use the apples for other stuff (like yummy homemade applesauce) while still making a valuable product from the “waste”. I also like it because it’s crazy easy. And I’m lazy. 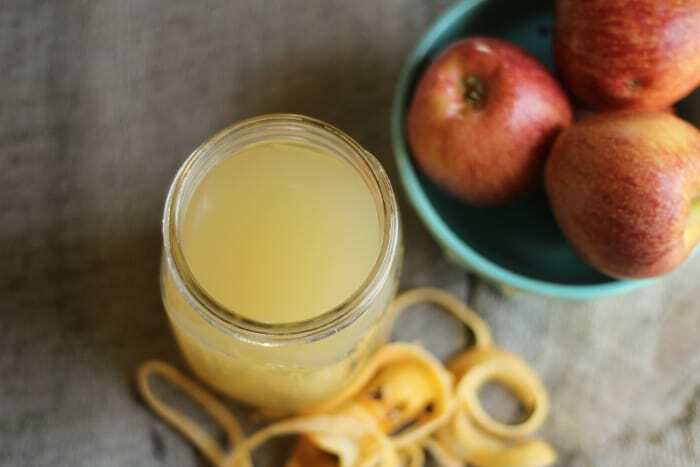 Fill the glass jar ¾ of the way with apple peels and cores. Cover loosely (I recommend a coffee filter or fabric scrap secured with a rubber band) and set in a warm, dark place for around two weeks. You can give it a stir every few days, if you like. If any brownish/greyish scum develops on the top, simply skim it off. Once two weeks has passed, strain the scraps from the liquid. At this point, my vinegar usually has a pleasantly sweet apple cider smell, but is still missing that lovely tang. Discard the scraps (or feed them to your chickens! ), and set the strained liquid aside for another 2-4 weeks. You’ll know your apple cider vinegar is complete once it has that unmistakable vinegary smell and taste. If it’s not quite there yet, simply allow it to sit a while longer. Once you are happy with the taste of your vinegar, simply cap and store in the fridge as long as you like. It won’t go bad. If a gelatinous blob develops on the top of your vinegar, congratulations! You have created a vinegar “mother”. This mother can be use to jump-start future vinegar batches. You can remove it and store it separately, but I usually just allow mine to float around in the vinegar as I store it. Use your homemade vinegar just like you would store-bought vinegar– for cooking, cleaning and everything in between! About preserving and pickling with homemade vinegar: It’s generally recommended that you do NOT use homemade vinegar for any sort of preservation. In order to ensure the safety of your home canned products, you need a vinegar with a acetic acid level of 5%. Since most of us don’t have a way to check the levels of our homemade vinegar, it’s best just to skip using it for canning or preserving– better safe than sorry! 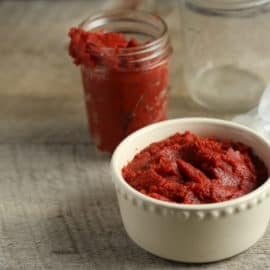 If your family doesn’t like peels in their homemade applesauce, this is the perfect way to keep them from going to waste. 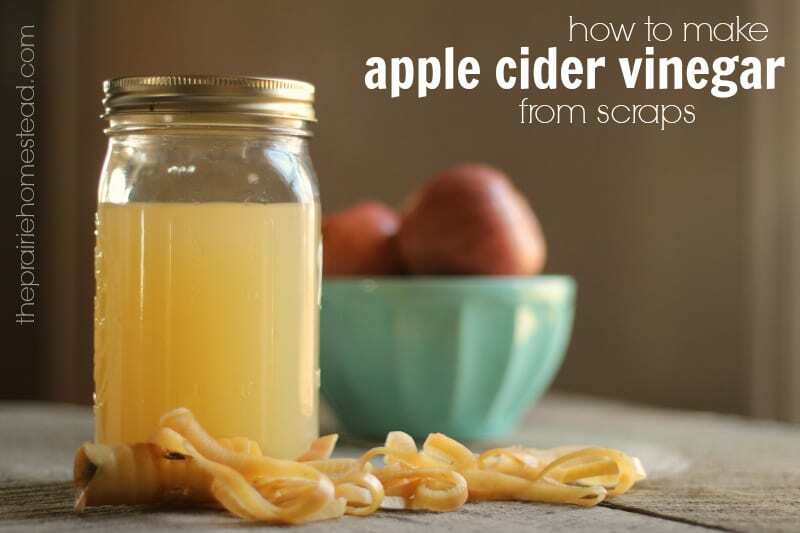 It’s perfectly fine to use scraps from slightly bruised or browned apples for your vinegar. However avoid using rotten or moldy fruit. Don’t have enough apple scraps for a full batch? No problem– just collect your scraps in the freezer until you have enough for a full jar. Since we’re using the peels for this recipe, I highly recommend starting with organic apples to avoid any pesticides or chemical residues. 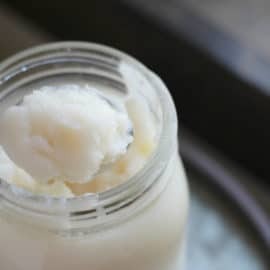 You could use honey (affiliate) in place of the sugar in this recipe if you really wanted too. However, using honey will slow down the process a bit. Also, keep in mind the beneficial organisms will be eating the sugar throughout the fermentation process, so there’ll be little to no sugar left in the final product. Looking for something new and exciting to make with your DIY apple cider vinegar? Try this DIY homemade gatorade. 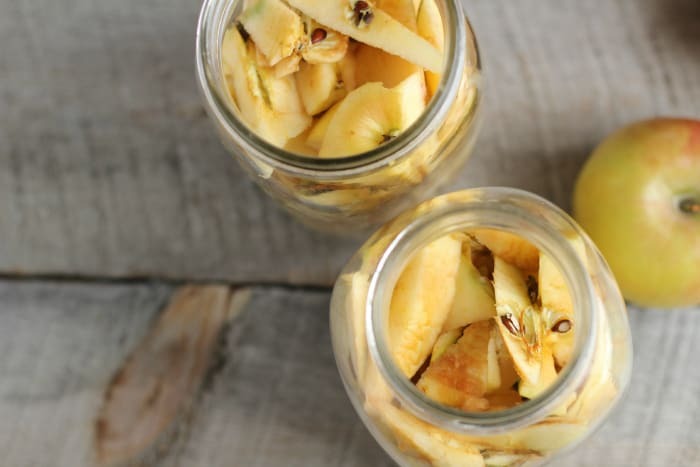 You can definitely experiment with other fruit scraps too– pears and peaches especially. 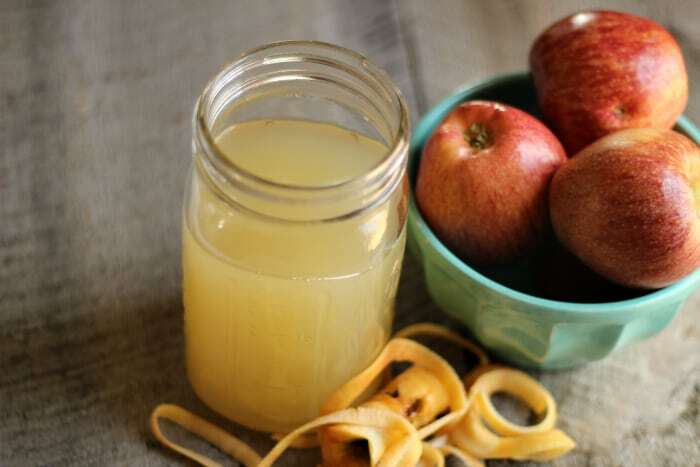 Fill the glass jar ¾ of the way with the apple peels and cores. At this point, my vinegar usually has a pleasantly sweet apple cider smell, but is still missing that unmistakable tang. Once you are happy with the taste of your vinegar, simply cap and store it as long as you like. It won’t go bad. Use your homemade vinegar just like you would storebought vinegar– for cooking, cleaning and everything in between! What a great way to use the scraps. I wish I had found this a few months ago.. we purchased almost 50 lbs of “seconds” from an orchard with the hopes of giving them to our pigs.They turned their little snouts up and walked the other way. I ended up looking at them for about a week and a half trying to decide what to do with them. They ended up in the compost bin. Never would have even thought possible. You are a genius. I will need to try next fall after the apple harvest! Wow! That seems easy enough! Thanks for sharing. Wow! Thank you! When we set it aside for another two weeks after straining should it be covered? Or left uncovered like before? I’m starting mine today! 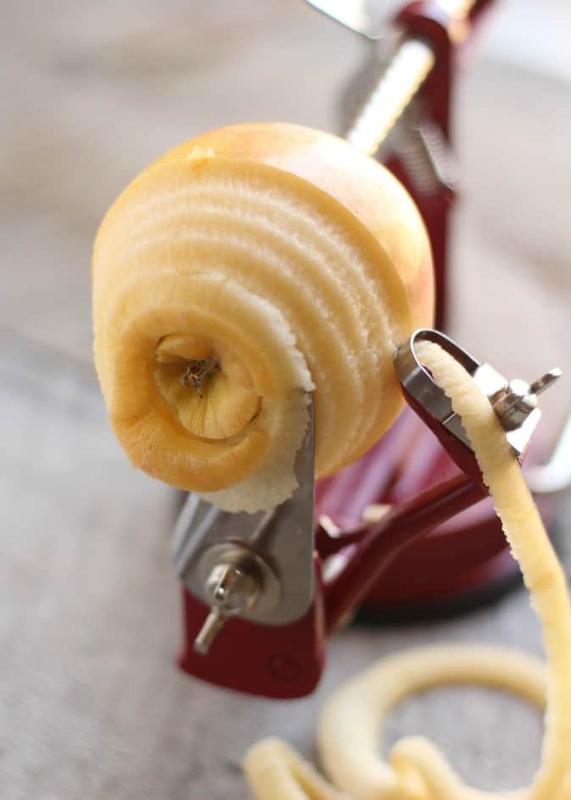 We can spiced apple rings in the fall and have LOTS of scraps left over…what a great way to use up the whole apple! Thank you for posting this! Such a great post!! I almost made apple cider vinegar last fall, but ended up avoiding it due to one little problem! We don’t spray our trees with any chemicals, and every year our apples are covered with sooty blotch and/or fly speck (both a type of fungus). 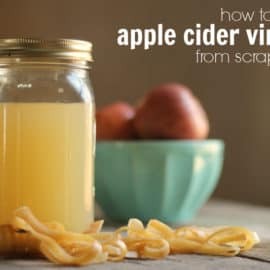 Does anyone know if those would effect making apple cider vinegar with the peels? This is one of my favorite posts! Raw apple cider is very expensive here and I would love to use more of it but wasn’t sure my checkbook could handle it. Two of my children are VERY picky eaters and refuse to eat apple peels, so this is a win, win for me. Thank you for inspiring so many changes in my life! You are very welcome Kati! I love timing like that! I have a friend that makes homemade apple cider vinegar. She loves it. I’ll definitely do this with all of our apple peels and cores. Too bad I have to wait for the apples to grow. 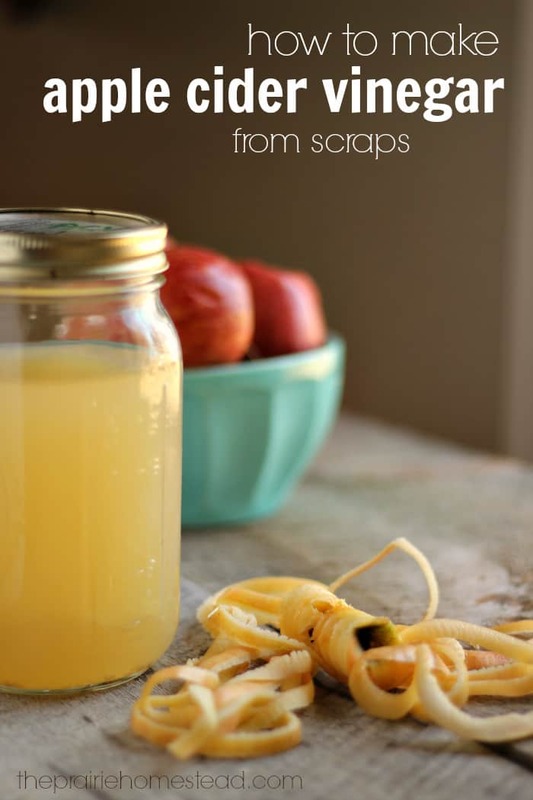 I’ve been making tons of baby applesauce lately – now I know what to do with all my scraps! Once you have a “mother”, how do you keep it? In the refrigerator as well? Will it die if not “fed”? You’ll need to keep it floating in a batch of vinegar to keep it alive. How would I use the ‘mother’? Thought I’d pop over to see what my friend has been up to. How fun! The last time I made apple cider vinegar was by accident, lol. I had pressed apples for raw apple juice, but forgot a jar in the back of my fridge. Several months later I discovered it and took a whiff to see if it was still good. It had begun to ferment and was at the hard cider stage. I left it on the counter for a few more weeks and eventually it turned to apple cider vinegar. 🙂 I love these kinds of experiments! I just made a lot of apple cider with some summer apples and thought I’d make some vinegar with some of it. Any reason why this wouldn’t be better than the scraps and chunks and sugar method? Hi Jill! Thanks so much for sharing this great recipe! Quick question – is the sugar necessary for anything besides taste? We’re a very low sugar family, and if it’s just for taste, I’d leave it out, but wondering if it’s needed for fermenting. Thanks so much! Can i use this applecider vinegar for weight loss. I have lots of apples but yuk they not tasty enough to eat raw. Something wrong with the tree i suppose. 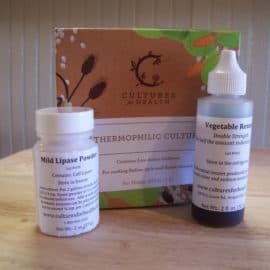 I was also wondering if this would be good to take a tablespoon before every meal if you are trying to lose weight, like some people do with store bought vinegar? WOW!!! Would never have thought it was possible to make vinegar. I’m so excited about this post! We went apple picking last year and had so many leftover cores from our applesauce. I tried making apple juice from them but it didn’t pan out as I had expected. I use so much vinegar year round so this will definitely be bookmarked! Thank you! Jill, I am sharing all of your “homemades” with my friends that love this kinda stuff! I was wondering if the vinegar has to be kept in the fridge once the fermentation process is done? Also, a quick comment to your comment about people who live in Texas… I am sorry that you are not able to work in your garden yet… I’ve lived here all my life but now, aside from the sultry summers, I am starting to love it here for the simple fact of being able to “keep” something growing year around… 2015 is starting my second year with a real garden! Yes– it’ll store in the fridge for a loooong time once it’s done. 🙂 And it’s awesome you can grow all year! I use the peel in making my apple sauce. I just throw the apples in the crockpot, then when they are mushy, I use my ricer to removed the peels. Can I use these cooked peels to make the cider vinegar? Thank you! Ooh! I just made some dehydrated apple chips for the kids (They love apple chips), this is a perfect way to deal with the scraps! I have a friend who uses organic apple cider for everything, and I’m already buying organic apples for the apple chips (I just bought trees to grow my own, but they aren’t producing yet) Two birds stoned at once haha! This has been on my bucket list…since we have 4 apple trees. I do everything with them, but I’ve yet to make vinegar. It will be fall (apple season) before I get around to this. Thanks for the nudge! I’m totally jealous of your apple trees!! Wow! Where did you learn this? You are the best…. I use acv constantly & had no idea it was this easy to make. Will make some this week. Braggs is gonna have a decline in sales!! Thanks for the apple cider vinegar post. I’ve stopped using apple peels because so many of them are waxed. And I don’t want to eat that! When the mother falls to the bottom of the jar, you know your vinegar is done. I made 10 gallons last summer. I got bragging rights. Way to go Janie! You definitely have bragging rights! Did you guys know that apple cider vinegar is GREAT for treating acne? You’d be surprised on how effectively it works! I am new of homesteading but have a wimpy apple tree in my yard. We don’t really treat it with anything but this year I plan to look at it a little more closely to see if I can do anything organically to it to help it along. In the past the apples have been quite scabby/wormy and sour. Would this effect the vinegar at all or have I found the perfect use for my apples? We are wondering about how to use the vinegar scoby. We already are using our wonderful scrap apple cider vinegar and have the scoby’s. Do we put the scoby on top of the apple peelings and scraps, or do we wait until we strain the scrap out & then add the scoby? We have three apple trees in our back yard and I am tired of making applesauce. I plan on freezing a bunch for future holiday baking but am so glad to find a way to use the peels and cores other than to make pectin with. Thank you so much for this post I can’t wait to try this out! I need to know the same thing as Renate above. I have a mother of vinegar, and want to make more vinegar. I do not have apple cider available to me, so would like to go with the scraps again. How to proceed? I love your website an recipes. Its a hugh help in making changes in multiple areas of our current lifestyle. Ok so I have a question. Is it possible to leave it on the counter with scraps for too long? With school starting and all I totally forgot when I started the process. Its been on the counter long enough for the scraps to start dropping to the bottom. Have I ruined my vinegar? If it still smells OK and isn’t moldy, you should be fine. Love this site,I have a question. Do I have to store vinegar in fridge? My space there is limited. Do you know if you can use pear cores/peels? I am about to make pear butter but would love to make vinegar with the scraps. Yes, pear scraps should work too! How can I use the mother to make more vinager, do I need to put more apples?